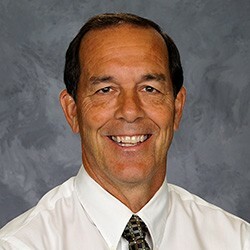 Mr. Tim Armelli is a 38-year educator and has been a member of the teaching staff at Chardon High School for 20 years. His was the voice heard over the Chardon High School PA system immediately after the shootings on February 27, 2012, instructing students and staff to “lock down”. His actions are credited with saving many lives. The school shooting at Chardon left three students dead and three others injured. Mr. Armelli teaches Health and Physical Education at Chardon High School and also coaches football and wrestling. As a head wrestling coach, Armelli’s teams won two Ohio High School Athletic Association state championships, one dual meet state championship and one tournament state championship. As an assistant football coach, Armelli helped his school win two state football championships. Interestingly enough, Tim coached against Coach Frank Hall, when Hall was in high school, in both the state football tournament and in the state wrestling tournament. He also coached against Coach Hall Foundation board member Andy Fetchik during Fetchik’s high school football playing days. Mr. Armelli is a graduate of Cleveland State University where he received his Bachelor’s and Master’s degrees. He and his wife Terri live in Mentor, OH, and they have two sons, Brian and Dan. Tim Armelli is a 2014 inductee into the Ohio High School Wrestling Hall of Fame.